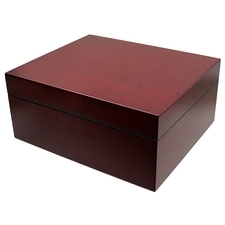 These large, all-hardwood Equinox humidors from Brigham offer enough room to store up to fifty of your favorite cigars and keep them all neat and organized with a single divider positioned right in the middle of the storage well. 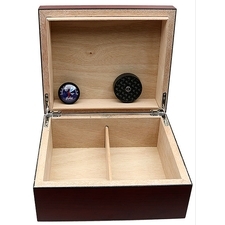 The hinged lid offers as secure, air-tight seal, which together with an accompanying analog hygrometer and 70% humidifier (itself compatible with Brigham's Humidor Solution) will ensure your cigars stay fresh and at optimum humidity. This particular example features a cherry body, offering a rich ruby finish that will match any home office.